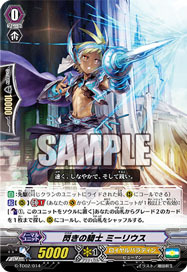 [A]: [Counterblast: (2)] When this is played to either (V) or (R), if you have a ::Narukami:: Vanguard, you may pay cost. If so, choose an Opponent's Grade 2 or lower Rearguard. Retreat that unit. Complete the mission successfully. It looks like a grim reaper of the battlefield.